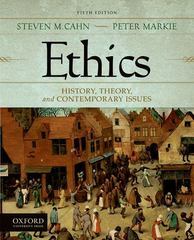 Ethics 5 Edition Ethics: History, Theory, and Contemporary Issues, Fifth Edition, features sixty-nine selections organized into three parts, providing instructors with great flexibility in designing and teaching a variety of courses in moral philosophy. Spanning 2,500 years of ethical theory, the first part, Historical Sources, ranges from ancient Greece to the twentieth century. It moves from classical thought through medieval views to modern theories, culminating with leading nineteenth- and twentieth-century thinkers. The second part, Modern Ethical Theory, includes many of the most important essays of the past century. The discussion of utilitarianism, Kantianism, egoism, and relativism continues in the work of major contemporary philosophers, while landmark selections reflect concern with moral language and the justification of morality. The concepts of duty, justice, and rights are explored, as well as recent views on cultural relativism and an ethic influenced by feminist concerns. In the third part, Contemporary Moral Problems, the readings present the current debates over abortion, euthanasia, famine relief, animal rights, environmentalism, and the use of torture in interrogations, as well as essays on death and the meaning of life. Wherever possible, each reading is printed in its entirety.The fifth edition features new readings from Cicero, Barbara Herman, and Judith Jarvis Thomson; an expanded selection from Joseph Butler's Fifteen Sermons; and a new translation of Kant's Groundwork for the Metaphysics of Morals. In addition, the book is supplemented for the first time by a robust support package. An Instructor's Resource CD contains reading summaries, essay questions, multiple-choice and true/false questions, PowerPoint-based lecture outlines, and relevant website links. A Companion Website at www.oup.com/us/cahn provides most of the material from the Instructor's Resource CD along with student resources including interactive self-quizzes, questions for discussion, and helpful links.